Change… this has been my family’s theme for this year. Some happy, some sad. Some planned, some unexpected. Some anticipated, some dreaded. Add in a few thousand road miles, lots of moving boxes, a new truck, a sprained ankle, several allergy attacks, a stumped toe, a break in, a few trips to the zoo, a new roof, several boxes of Kleenex, a new beginning, a chain saw, some great new friends, an ambulance ride, lots of birthday cakes, a first birthday party, a last birthday party, a graduation, a 25th anniversary, a new venture, and lots and lots of new underlines, notes & highlights in a Bible and that just about sums up the last 12 months. Never the family to slow down, the upcoming weeks will include, another child moving, more birthday cakes, another graduation, another grand-baby born, another wedding and a vacation (whew).… of course, that’s all we know about so far! ​“God is our refuge and strength, a very present help in trouble. Don’t misunderstand, I’m not complaining, just summarizing. That list above is just a list of LIFE. It may look similar to yours or very different; your list may be a lot longer or shorter. But if we all made a list of our life events over the past twelve months, one thing they would all have in common is… change. Something in your life has changed. Although the world and our life circumstances are constantly changing around us, we can gain strength and stability in the one constant surrounding us… the Heavenly Father. As we are reassured of this in Psalm 46. ​Through all of these changes last year, and for all of the years prior, God has been my stability. He has been my comfort and reassurance. If my life can give no other testimony than this, it is that God is always present, always aware, always working and always holding His children in His hand. And although at any point in time, for however long, even though a life circumstance may change or may not seem ideal, God can and will bring forth a blessing, even from the most difficult of circumstances. ​My life verse for thirty years now; God has always fulfilled this promise. Although many dramatic changes have occurred over those years, a blessing has always grown from the circumstances. Maybe not immediately, maybe it took time to realize the connection. I have learned that life is like a chain, each event bound to another….. There is not any present moment that is unconnected with some future one. The life of every man is a continued chain of incidents, each link of which hangs on the former. The transition from cause to effect, from event to event, is often carried on by secret steps, which our foresight cannot discover and our wisdom is unable to trace. 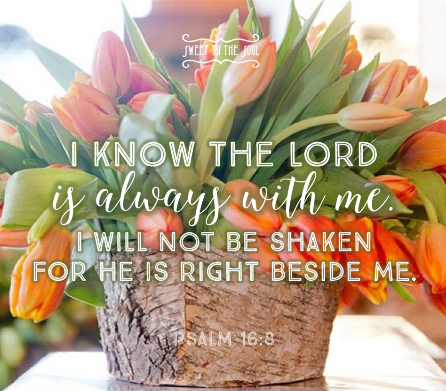 I have also learned and know with absolute certainty that God is always with me…. Father, I thank you so much that even as everything else around me seems to be changing, I can always count on you. I know that you never change. You will always love me, always show me mercy and always give me hope. Ahh yes my friend. Change has filled my life over the last year. Some of it I DID NOT like :) But in it all, I hung on to God and He has shown His unchanging character. Praise the Lord!